How best to portray two people with three persona’s… using a caricature of course. 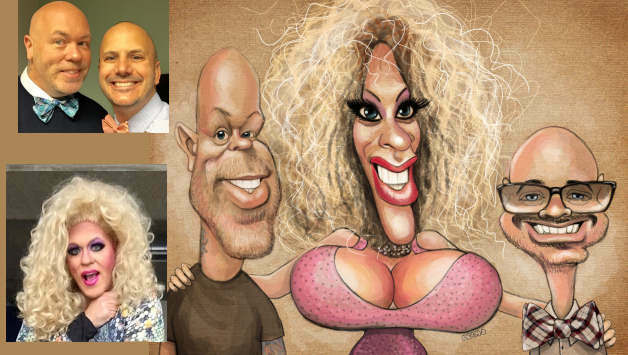 This fun custom caricature artwork by caricaturist Keimo shows the two, the third is the performer ‘drag Queen persona’ of one. Using the exaggerated caricature approach, the performer is integrated into the group of three. The custom artwork shows flair and imagination and what can be achieved between collaboration with the client. If you would like to arrange a custom caricature of one or two people or even a group caricature , feel free to contact us. There are eight artists in the team who can help create something special and memorable, no matter what the occasion.